The Mexican Institute for Competitiveness (Instituto Mexicano para la Competitividad AC, IMCO) has published its annual analysis of the competitiveness of Mexico’s states. The report provides some interesting insights into which areas of Mexico are “most competitive” in business terms, defined as their capacity to attract and retain investments and a talented workforce. This suggests a business environment that maximizes the socio-economic potential of both the business entities and individuals residing in a a specific area. It also suggests that any improved well-being (economic and social) will be maintained (sustained). The index is based on 89 indicators in 10 sub-indices. The 10 major factors include the reliability and objectivity of the legal system, the sustainable management of the natural environment, the stability of macroeconomic policies, the degree to which society is non-divisive, educated and healthy, and the stability and functioning of the political system. The latest report relies on 2012 data. 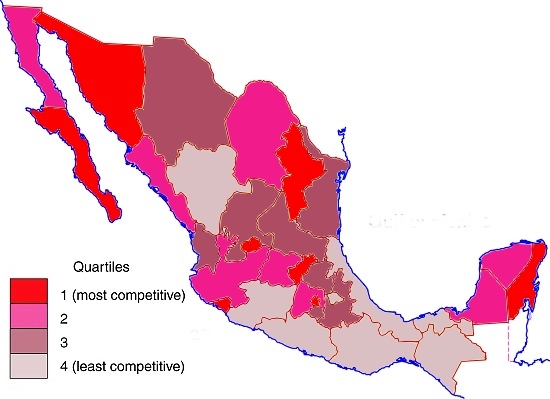 Mexico’s basic pattern of competitiveness at the state level is shown in the map. While a full analysis of why some states are more competitive than others is beyond the scope of this post, the single most striking aspect of this map is the persistent low degree of competitiveness of several of Mexico’s poorest states, such as Guerrero, Oaxaca and Chiapas. In general, states in Northern Mexico are noticeably more competitive than those in Southern Mexico. Two areas on opposite coasts where tourism is extremely important to the local and national economy – Baja California Sur and Quintana Roo – are both very competitive.